Interpublic Group veteran Philippe Krakowsky has been named Chairman of IPG Mediabrands. In this newly created role, Krakowsky will partner with Henry Tajer, Global CEO of IPG Mediabrands, to lead the media management company, which oversees $37 billion in global billings and oversees media agencies UM, Initiative, BPN and a number of specialty units. Tajer took the helm of Mediabrands as CEO last March when he replaced Matt Seiler. Krakowsky will continue to report to IPG Chairman and CEO Michael Roth, while Tajer will now report jointly to both Roth and Krakowsky. IPG said that Krakowsky will continue in his corporate role as EVP, Chief Strategy and Talent Officer, as he supports Tajer and his senior Mediabrands management team in further building the firm’s media operations, one of IPG's fastest-growing units. 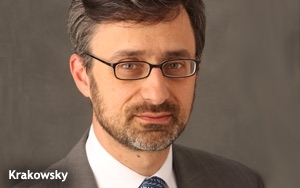 For more than a decade, Krakowsky has played a key part in major strategic actions at Interpublic, including: oversight of the development and integration of digital/emerging media capabilities across the group; the creation of IPG Mediabrands; and leadership of the company's Healthcare Council. Krakowsky has also been responsible for designing many of the integrated, cross-agency client teams that are a hallmark of the company’s "open architecture" to serve clients. Krakowsky has served on the board of a number of IPG agencies, including Ansible, Huge and O'Keefe Reinhardt & Paul, and mentors early stage companies as part of the R/GA Accelerator program. He also served as interim CEO of FCB for six months prior to the arrival of its current leader. Krakowsky started his career as an entrepreneur in the technology industry, helping to build and ultimately sell an artificial intelligence software development company to Apple Computer. 1 comment about "IPG's Philippe Krakowsky Named Chairman IPG Mediabrands". Henry Blaufox from Dragon360, February 12, 2016 at 10:38 a.m. Meanwhile, whatever happened to IPG Mediabrands much touted initiative to do fifty plus percent of their business across all channels via programmatic? When announced in 2013, the goal for completion in the US was within three years, then on to UK and other regions thereafter. Have there been public announcements of progress toward the goal recently? The three year period is nearly over.